During the spring asparagus is in full bloom. The allure with these elegant spears lies in their versatility. Whether blanched, sautéed or grilled, you’ll love the way they’re served up. Season these stalks with olive oil, garlic salt, pepper, and rosemary. Bake at 375 for 15 - 20 minutes. 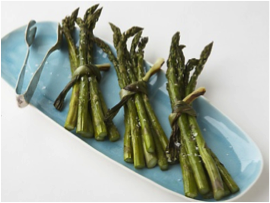 Get creative by wrapping them with scallions for an elegant presentation. Literally wrap it up with this simple, fast, and incredibly easy recipe. 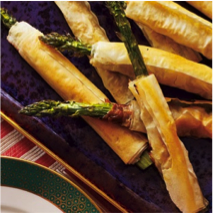 All you need is phyllo dough, butter, salt/pepper and asparagus. Unwrap the phyllo and cut the stack in half lengthwise. Take the dough and brush lightly with some melted butter, sprinkle with salt and pepper, then wrap each asparagus. Bake at 375 for 15 minutes! 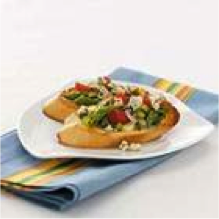 Asparagus Bruschetta provides a delicious twist on an Italian staple. The beautiful colors, mouth watering taste, and excellent simplicity, allow this dish to please all. Tomatoes, parsley, onion, and asparagus served raw and fresh! GrubDanielle Lieberman June 4, 2012 Dessert, Recipes!